Teaching Math to kids can be a hair-pulling exercise for most parents. And don't even get me started on making kids LOVE Math. Truth is, Math is a skill that takes a lot of brain power to master, and this can be viewed by kids as hard work. But surely there must be a way (or ways) to make kids not to fear Math, no? No doubt solving Math questions can be tedious and tough, but what usually makes it worse is if a child has NO interest in the subject. So the trick is - as with all other subjects - to expose kids to Math in fun ways since they are more receptive to learning when it is associated more with play than with work. So when a unique Math enrichment program in the form of Math Monkey that claims to bring the fun out in Math came along, my interest was piqued. Started in Florida, USA in 2006 by a former teacher and early childhood educator, Ms. Kirsten Fisch, Math Monkey's program extends beyond the learning of mathematics. Its emphasis on game sessions during lessons encourage children to think on their feet, nurture mental agility, creativity, independence, sportsmanship and team-building skills. Based on the philosophy that FUN is the key to learning, Vedic Math concepts are taught using carefully designed games and tools. Wait, what's Vedic Math you ask? I too, had the same question when I first heard about it. Vedic Math is an ancient system of mathematics. No, students do not sit around cross-legged meditating for enlightenment on Maths. Rather, Vedic Math is an approach that allows children to perform calculations mentally with great accuracy, simplicity and speed. And accurate, simple and fast was exactly what I saw from both Ash and Ayd after a few lessons at Math Monkey. I am thankful that they do not actually abhor Math but what makes me go bonkers when I survey their Math school work is the amount of careless mistakes they make! When I asked them why they do not check their work properly, their answer was it is too troublesome and tedious to do so. See, can puke blood. Thankfully, Math Monkey's program had introduced them to the wonderful world of Math hacks where they learnt various concepts to mentally compute various Math sums. In fact, they usually take turns to challenge (and in the process, humiliate) me to mental sums in the car immediately after their lessons! "What is 22 x 24?" "What is 8.5 ÷ 5?" "Is 398 divisible by 9?" Let me just say they managed to blurt out the answers in less than 5 seconds. Play is an essential component in its program. Carefully designed and well-thought out games are used to teach Math. A strong focus on learning through play has been shown to enhance intellectual and emotional development so in fact, half of the weekly 1-hour lesson is always devoted to games! Safe to say, the games are a huge hit with the boys. Whether it is playing race cars in a mathematical championship (students are encouraged to dress up as an Auto Racing Super Star by the way!) or picking up marbles using chopsticks, the boys lapped everything up. And the great thing is they do not even have the slightest clue that they are learning! Students are taught to engage their minds so that they to develop an intuitive understanding of numbers, their relationships, and how they are affected by operations. Children with strong number sense are better problem solvers; they can approach solving a problem in different ways, identify errors in their work when they occur, and be more confident and interested in Math because Mental Math builds the mental math ability of children and sharpen concentration and memory skills. One key feature about Vedic Math is flexibility. There is more than one solution to a problem so children can get creative in using a variety of methods to solve a sum. This leads to more creative, interested and motivated students, resulting in improved memory and greater mental ability. So who says Mathematics got to be rigid and boring? Math Monkey's teacher-to-students ratio is a small 1:8, which is why teaching through the use of games can be carried out more effectively. The teachers have all gone through a comprehensive Math Monkey training course and are certified. More importantly though, I observed that they genuinely love teaching Math - essential in engaging the students and ensuring a possibly dry subject like Math seem fun! Math Monkey's program is suitable for all ability ranges, and are divided into various levels depending on the mathematical abilities of the individual child. This gives the challenges necessary for a child to continuously push their own boundaries of knowledge and allowing a child to build the necessary foundations. 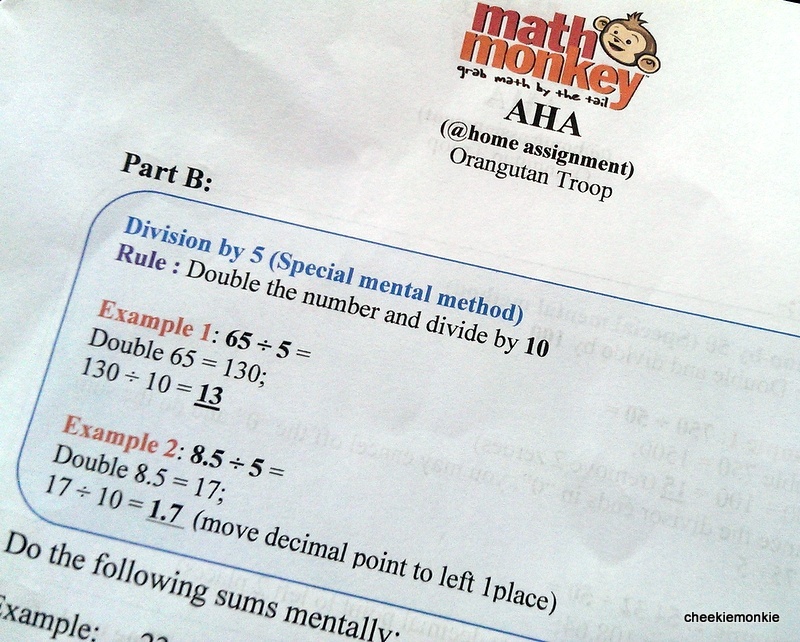 Ash and Ayd are in the Orang Utan Troop (kids aged 9 - 10) program which builds the students' mental agility as they are taught how to perform Math calculations with speed and precision. Skills in computing multiplication and division sums are honed, together with the introduction of more complex fractions problems. Six lessons at Math Monkey may not be an accurate gauge to see if there are any improvements to the boys' carelessness but at least I have seen that they truly love the lessons there. In fact, they gamely tackle the extra Math homework immediately after we get home from class. And I think it is due to the fact that they are now able to use the principles learnt to simplify Math problems to a level that they can master confidently. If you are keen to find out more, or wish to let you child experience what Math Monkey has to offer, sign up for a FREE Trial Class now! Visit www.mathmonkey.com.sg for more details or call 83388656 to book.